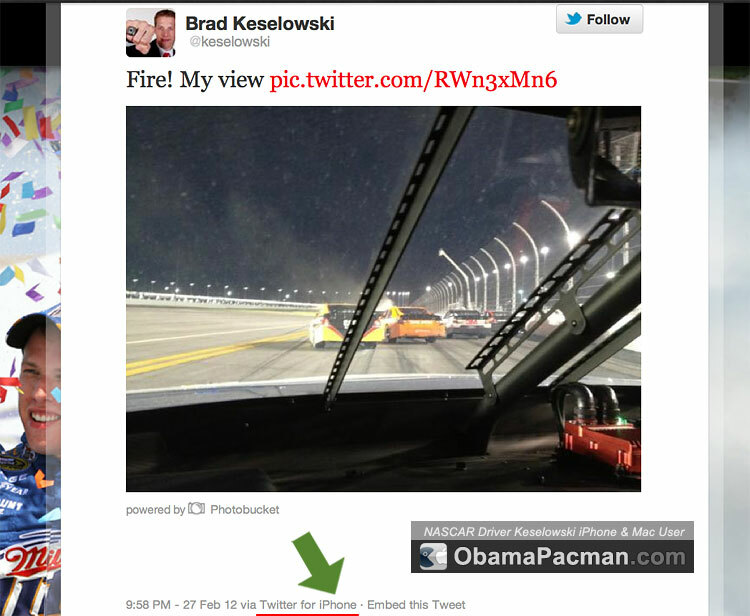 Racecar driver Brad Keselowski used iPhone to tweet during the Daytona 500 race, gained 100,000 followers in an hour. Keselowski, the 2010 NASCAR Nationwide Series Champion, was not going around the track at racing speed of near 200MPH. The 2012 Daytona 500 stopped With 40 laps to go due to the red flag, allowing time for him to tweet on his iPhone. Where does Keselowski put his iPhone when the race continues? This entry was posted on Tuesday, February 28th, 2012 at 5:47 pm	and is filed under Celebs with Macs. You can follow any responses to this entry through the RSS 2.0 feed.